Supernova Is An Exploding Star In The Universe. Supernova happens in the universe when a star explodes. Supernova is a stellar explosion which produces an extremely bright object made of plasma that declines to invisibility over weeks or months. A supernova briefly outshines its entire host galaxy. It would take 10 billion years for the Sun to produce the energy output of an ordinary Type II supernova. The Sun is notably too small to ever become a supernova-rather it will become a White Dwarf. 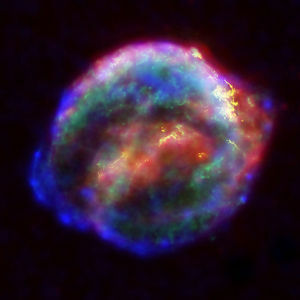 Multiwavelength X-ray image of the remnant of Kepler's Supernova, SN 1604. (Chandra X-ray Observatory). There are several different types of supernovae and two possible routes to their formation. A massive star may cease to generate fusion energy from fusing the nuclei of atoms in its core, and collapse under the force of its own gravity to form a neutron star or black hole. Alternatively, a White Dwarf star may accumulate material from a companion star until it nears its Chandrasekhar limit and undergoes runaway nuclear fusion in its interior, completely disrupting it. This second type of supernova is distinct from a surface thermonuclear explosion on a white dwarf, which is called a nova. In either type of supernova, the resulting explosion expels much or all of the stellar material with great force. 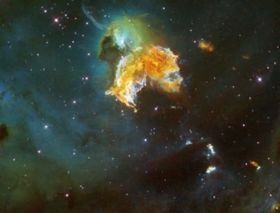 The explosion drives a blast wave into the surrounding space, forming a Supernova remnant. One example of this process is the remnant of SN 1604, shown to the right. "Nova" is Latin for "new", referring to what appears to be a very bright new star shining in the celestial sphere; the prefix "super" distinguishes this from an ordinary nova, which also involves a star increasing in brightness, though to a lesser extent and through a different mechanism. The Crab Nebula is a pulsar wind nebula associated with the 1054 supernova. 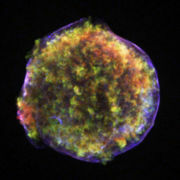 The earliest recorded supernova, SN 185, was viewed by Chinese astronomers in 185 CE. 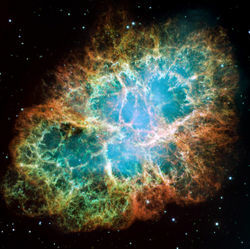 A widely-observed supernova, SN 1054, produced the Crab Nebula. Supernovae SN 1572 and SN 1604, the last to be observed in the Milky Way galaxy, had notable impacts on the development of astronomy in Europe. Since the development of the telescope, the field of supernova discovery has expanded to other galaxies, beginning first with the 1885 observation of supernova S Andromedae in the Andromeda Galaxy. These events provide important information on cosmological distances. During the twentieth century, successful supernova models for each type of supernovae were developed, and the role of supernova in the star formation process is now increasingly understood. 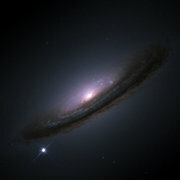 Most recently it has been discovered that the most distant Type Ia supernovae appeared dimmer than expected. This has provided evidence that the expansion of the universe may be accelerating. SN 1994D in the NGC 4526 galaxy (bright spot on the lower left). Image by NASA, ESA, The Hubble Key Project Team, and The High-Z Supernova Search Team. The explosion of supernovae in other galaxies cannot be predicted with any meaningful accuracy. When they are discovered, they are already in progress. Most uses for supernovae - as standard candles, for instance - require an observation of their peak luminosity. It is therefore important to discover them well before they reach their maximum. amateur astronomers, who greatly outnumber professional astronomers, have played an important role in finding supernovae, typically by looking at some of the closer galaxies through an optical telescope and comparing them to earlier photographs. Towards the end of the 20th century, astronomers increasingly turned to computer-controlled telescopes and CCDs for hunting supernovae. While such systems are popular with amateurs, there are also larger installations like the Katzman Automatic Imaging Telescope. Supernova searches fall into two regimes: high Redshift and low redshift, with the boundary falling somewhere around a redshift of z = 0.2. High redshift searches for supernovae involve the observation of (usually) Type Ia supernova light curves for use as standard or calibrated candles to generate Hubble diagrams and make cosmological predictions. At low redshift, supernova spectroscopy is more practical than at high redshift, and these data can be used to study the physics and environments of supernovae. Low redshift observations also anchor the low redshift end of the Hubble curve. Supernova discoveries are reported to the International Astronomical Union's Central Bureau for Astronomical Telegrams which sends out a circular with the name it assigns to it. The name is formed by the year of discovery, immediately followed by a one or two-letter designation. The first 26 supernovae of the year get an upper case letter from A to Z. Afterward, pairs of lower-case letters are used, starting with aa, ab, and so on. Professional and amateur astronomers currently find between 300 and 400 supernovae a year. For example, the last supernova of 2005 was SN 2005nc, indicating that it was the 341st supernova found in 2005 (a record year, in fact). Four historical supernovae are known simply by the year they occurred: SN 1006, 1054, 1572 (Tycho's Nova), and 1604 (Kepler's Star); starting with 1885, the letters are used, even if there was only one supernova that year (e.g. SN 1885A, 1907A, etc.) -this last happened with SN 1947A. The standard abbreviation "SN" is an optional prefix. As part of the attempt to understand supernovae, astronomers have classified them according to the lines of different chemical elements that appear in their spectra. The first element for a division is the presence or absence of a line from Hydrogen. If a supernova's spectrum contains a hydrogen Balmer line, it is classified Type II, otherwise it is Type I. Among those groups, there are subdivisions according to the presence of other lines and the shape of the light curve of the supernova. Type Ia Lacks Hydrogen and present a singly-ionized silicon (Si II) line at 615.0 nm, near peak light. Type Ib Non-ionized helium (He I) line at 587.6 nm and no strong silicon absorption feature near 615 nanometers. Type Ic Weak or no helium lines and no strong silicon absorption feature near 615 nanometers. Type IIL Displays a "linear" decrease in their light curve, where it is "linear" in magnitude versus time, or exponential in luminosity versus time. The supernovae of Type II can also be sub-divided based on their spectra. While most Type II supernova show very broad emission lines which indicate expansion velocities of many thousands of km/s, some have relatively narrow features. These are called Type IIn, where the "n" stands for "narrow". The most commonly accepted theory of this type of supernovae is that they are the result of a carbon-Oxygen White Dwarf accreting matter from a nearby companion star, typically a red giant. If the accretion continues long enough, the white dwarf may eventually approach the Chandrasekhar limit (1.44 solar masses), the maximum mass that can be supported by electron degeneracy pressure, beyond which the white dwarf would collapse to form a neutron star (if nothing intervened to stop the process). The current view is that this limit is never actually attained, so that collapse is never initiated. Instead, the increase in pressure raises the temperature near the center, and a period of convection lasting approximately 100 years begins. At some point in this simmering phase, a deflagration flame front powered by carbon fusion is born, although the details of the ignition-the location and number of points where the flame begins-is still unknown. Oxygen fusion is initiated shortly thereafter, but this fuel is not consumed as completely as carbon. Once fusion begins, the white dwarf quickly discovers that its dependence on degeneracy pressure (rather than thermal pressure) to support its weight against gravity carries a heavy price. It is unable to respond to the initial temperature increase by expanding and cooling (because degeneracy pressure is independent of temperature), and thus cannot regulate the burning in the manner of normal stars. The flame accelerates dramatically, through the Rayleigh-Taylor instability and interactions with turbulence. It is still a matter of considerable debate as to whether this flame transitions from a subsonic deflagration into a supersonic detonation. Regardless of the exact details of nuclear burning, it is generally accepted that a substantial fraction of the carbon and oxygen in the white dwarf is burned into heavier elements within a period of only a few seconds, raising the internal temperature to billions of degrees. This energy release from thermonuclear burning (˜1044 joules) is more than enough to unbind the star; that is, the individual particles making up the white dwarf gain enough kinetic energy that they are all able to fly apart from each other. The star explodes violently and releases a shock wave in which matter is typically ejected at speeds on the order of 10,000 km/s, or roughly 3% of the speed of light. The energy released in the explosion also causes an extreme increase in luminosity. The typical Absolute magnitude of Type Ia supernovae is -19.5 (˜ 5 billion times brighter than Sol), with little variation. The theory of this type of supernovae is similar to that of Novae, in which a White Dwarf accretes matter more slowly and does not approach the Chandrasekhar limit. In the case of a nova, the infalling matter causes a hydrogen fusion surface explosion that does not disrupt the star. Type Ia supernovae have a characteristic light curve, their graph of luminosity as a function of time after the explosion. Near the time of maximum luminosity, the spectrum contains lines of intermediate-mass elements from Oxygen to calcium; these are the main constituents of the outer layers of the star. Months after the explosion, when the outer layers have expanded to the point of transparency, the spectrum is dominated by light emitted by material near the core of the star, heavy elements synthesized during the explosion, most prominently iron-group elements. The radioactive decay of nickel-56 through Cobalt-56 to iron-56 produces high-energy photons which dominate the energy output of the ejecta at intermediate to late times. Unlike the other types of supernovae, Type Ia supernovae generally occur in all types of galaxies, including ellipticals. They show no preference for regions of current stellar formation. The similarity in the absolute luminosity profiles of nearly all known Type Ia supernovae has led to their use as a standard candle in extragalactic astronomy. The cause of this uniformity in the luminosity curve is still an open question. In 1998, observations of Type Ia supernovae indicated the unexpected result that the universe seems to undergo an accelerating expansion. A second possible, but much less likely, mechanism for triggering a Type Ia supernova is the merger of two white dwarfs. In such a case, the total mass would not be constrained by the Chandrasekhar limit. This is one of several explanations proposed for the anomalously massive (2 solar mass) progenitor of the "Champagne Supernova" (SN 2003fg or SNLS-03D3bb). Type Ib and Ic supernova. These events, like supernovae of Type II, are probably massive stars running out of fuel at their centers; however, the progenitors of Types Ib and Ic have lost most of their envelopes due to strong stellar winds or interaction with a companion. Type Ib supernovae are thought to be the result of a Wolf-Rayet star collapsing. There is some evidence that a few percent of the Type Ic supernovae may be the progenitors of gamma ray bursts, though it is also thought that any Hydrogen stripped core-collapse supernova (Type Ib, Ic) could be a GRB dependent upon the geometry of the explosion. Stars far more massive than the sun evolve in much more complex fashions. In the core of the sun, hydrogen is fused into helium, releasing energy which heats the sun's core, and providing pressure which supports the sun's layers against collapse (see hydrostatic equilibrium). The helium produced in the core accumulates there since temperatures in the core are not yet high enough to cause it to fuse. Eventually, as the hydrogen at the core is exhausted, fusion begins to slow down and gravity begins to cause the core to contract. This contraction raises the temperature high enough to initiate a shorter phase of helium fusion, which accounts for less than 10% of the star's total lifetime. In stars with less than eight solar masses, the carbon produced by helium fusion does not fuse, and the star gradually cools to become a White Dwarf. White dwarf stars, if they have a near companion, may then become Type Ia supernovae. A much larger star, however, is massive enough to create temperatures and pressures needed to cause the carbon in the core to begin to fuse once the star contracts at the end of the helium-burning stage. The cores of these massive stars become layered like onions as progressively heavier atomic nuclei build up at the center, with an outermost layer of hydrogen gas, surrounding a layer of hydrogen fusing into helium, surrounding a layer of helium fusing into carbon (via the triple-alpha process), surrounding layers that fuse to progressively heavier elements. As a star this massive evolves, it undergoes repeated stages where fusion in the core stops, and the core collapses until the pressure and temperature is sufficient to begin the next stage of fusion, reigniting to halt collapse. Core collapse of a supernova. The factor limiting this process is the amount of energy that is released through fusion, which is dependent on the binding energy of these atomic nuclei. Each additional step produces progressively heavier nuclei, which release progressively less energy when fusing, until iron is produced. As iron has the highest binding energy per nucleon of all the stable elements, it cannot produce energy when fused, and an iron core grows. This iron core is under huge gravitational pressure. As there is no fusion to further raise the star's temperature to support it against collapse, it is supported only by degeneracy pressure of electrons. When the core's size exceeds the Chandrasekhar limit, degeneracy pressure can no longer support it, and catastrophic collapse ensues. As the core collapses, it heats up, producing high energy gamma rays which decompose iron nuclei into helium nuclei and free neutrons (via photodissociation). As the core's density increases, it becomes energetically favorable for Electrons and protons to merge via inverse beta decay, producing Neutrons and neutrinos. The neutrinos escape from the core, carrying away energy and further accelerating the collapse, which proceeds in milliseconds as the core detaches from the outer layers of the star. Some of these neutrinos are absorbed by the star's outer layers, beginning the supernova explosion. For Type II supernovae, the collapse is eventually halted by short-range repulsive neutron-neutron interactions mediated by the strong force, as well as by degeneracy pressure of neutrons, at a density comparable to that of an atomic nucleus (forming a neutron star). Once collapse stops, the infalling matter rebounds, producing a shock wave which blows off the rest of the star's material. The core collapse phase is known to be so dense and energetic that only neutrinos are able to escape. Most of gravitational potential energy of the collapse gets converted to a ten second neutrino burst, releasing about 1046 joules (100 foes). Of this energy, about 1044 J (1 foe) is reabsorbed by the star producing an explosion. The energy per particle in a supernova is typically one to one hundred and fifty picojoules (tens to hundreds of MeV). The neutrinos produced by a supernova have been actually observed in the case of Supernova 1987A leading astronomers to conclude that the core collapse picture is basically correct. Several currently operational neutrino detectors have established a Supernova Early Warning System, which will attempt to notify the astronomical community in the event of a supernova in the Milky Way Galaxy. The per-particle energy involved in a supernova is small enough that the predictions gained from the Standard Model of particle physics are likely to be basically correct, but the high densities may include corrections to the Standard Model. In particular, Earth-based particle accelerators can produce particle interactions which are of much higher energy than are found in supernovae, but these experiments involve individual particles interacting with individual particles, and it is likely that the high densities within the supernova will produce novel effects. The interactions between neutrinos and the other particles in the supernova take place with the weak nuclear force which is believed to be well understood. However, the interactions between the protons and neutrons involve the strong nuclear force which is much less well understood. The major unsolved problem with Type II supernovae is that it is not understood how the burst of neutrinos transfers its energy to the rest of the star producing the shock wave which causes the star to explode. From the above discussion, only one percent of the energy needs to be transferred to produce an explosion, but getting that one percent of transfer has proven very difficult. In the 1990's, one model for doing this involved convective overturn, which suggests that convection, either from neutrinos from below, or infalling matter from above, completes the process of destroying the progenitor star. Heavier elements than iron are formed during this explosion by neutron capture, and from the pressure of the neutrinos pressing into the boundary of the "neutrinosphere", seeding the surrounding space with a cloud of gas and dust which is richer in heavy elements than the one the star originally formed from. Neutrino physics, which is modeled by the Standard Model, is crucial to the understanding of this process. The other crucial area of investigation is the hydrodynamics of the plasma that makes up the dying star, how it behaves during the core collapse determines when and how the "shock wave" forms and when and how it "stalls" and is reenergized. Computer models have been very successful at calculating the behavior of Type II supernovae once the shock has been formed. By ignoring the first second of the explosion, and assuming that an explosion is started, astrophysicists have been able to make detailed predictions about the elements produced by the supernova and of the expected light curve from the supernova. Of the Type II supernovae with unusual features in their spectra, Type IIn supernovae may be produced by the interaction of the ejecta with circumstellar material. Type IIb supernovae are likely massive stars which have lost most, but not all, of their hydrogen envelopes. As the ejecta expand, the hydrogen layer quickly becomes optically thin and reveals the deeper layers. The core collapse of sufficiently massive stars may not be halted. Degeneracy pressure and repulsive neutron-neutron interactions can only support a neutron star whose mass does not exceed the Tolman-Oppenheimer-Volkoff limit of very roughly 4 solar masses. Above this limit, the core collapses to directly form a black hole, perhaps producing a (still theoretical) Hypernova explosion. In the proposed hypernova mechanism (known as a Collapsar) two extremely energetic jets of plasma are emitted from the star's rotational poles at nearly light speed. These jets emit intense gamma rays, and are one of many candidate explanations for Gamma ray bursts. The stellar mass cutoff point for neutron star vs. black hole formation is not precisely known, but is expected to be in the range of 25 to 50 times the mass of the Sun. Type I versus Type II supernovae. A fundamental difference between Type I and Type II supernovae is the source of energy for the radiation emitted near the peak of the light curve. The progenitors of Type II supernovae are stars with extended envelopes that can attain a degree of transparency with a relatively small amount of expansion. Most of the energy powering emission at peak light is derived from the shock wave that heats and ejects the envelope. The progenitors of Type I supernovae, on the other hand, are compact objects much smaller than Sol that must expand (and therefore cool) enormously before becoming transparent. Heat from the explosion is dissipated in the expansion and is not available for light production. The radiation emitted by Type I supernovae is thus entirely attributable to the decay of radionuclides produced in the explosion, principally nickel-56 (with a half-life of 6.1 days) and its daughter Cobalt-56 (with a half-life of seventy-seven days). Gamma rays emitted during the decays are absorbed by the ejected material, heating it to incandescence. As the material ejected by a Type II supernova expands and cools, radioactive decay eventually takes over as the main energy source for light emission in this case also. A bright Type Ia supernova may expel 0.5-1.0 solar mass of Nickel-56, while a Type Ib, Ic or Type II supernova probably ejects closer to 0.1 solar mass of Nickel-56. Supernova nucleosynthesis: Interstellar impact: Supernovae as a source of heavy elements. Supernovae are the main source of all the elements heavier than Oxygen. These elements are produced by fusion (for iron fifty-six,56Fe, and lighter elements), and by nucleosynthesis during the supernova explosion for elements heavier than iron. The only competing process for producing elements heavier than iron is the S-process in large, old red giant stars, which produces these elements much more slowly, and which cannot produce elements heavier than Lead. Supernovae generate tremendous temperatures, and under the right conditions, the fusion reactions that take place during the peak moments of a supernova can produce some of the heaviest elements, such as plutonium and californium. Role of supernovae in stellar evolution: Supernova remnant. The remnant of the supernova explosion consists of a compact object and a rapidly expanding shock wave of material. This cloud of material sweeps up the surrounding interstellar medium during a free expansion phase, which can last for up to two centuries. The wave then gradually undergoes a period of adiabatic expansion, and will slowly cool and mix with the surrounding interstellar medium over a period of about 10,000 years. These injected elements ultimately enriching the molecular clouds that are the sites of star formation. Thus, each stellar generation has a slightly different composition, going from an almost pure mixture of Hydrogen and helium to a more metal-rich composition. Supernovae are the dominant mechanism for distributing these heavier elements, which are formed in a star during its period of nuclear fusion, throughout space. The different abundances of elements in the material that forms a star have important influences on the star's life, and may decisively influence the possibility of having planets orbiting it. The kinetic energy of an expanding SNR can trigger star formation due to compression of nearby, dense molecular clouds in space. However the increase in turbulent pressure can also prevent star formation if the cloud is unable to lose the excess energy. Evidence from daughter products of short-lived radioactive isotopes shows that a nearby supernova helped determine the composition of the Solar System 4.5 billion years ago, and may even have trigger the formation of this system. Supernova production of heavy elements over astronomic periods of time ultimately made the chemistry of life on Earth possible. Impact of supernovae on Earth. A near-Earth supernova is an explosion resulting from the death of a star that occurs close enough to the Earth (roughly fewer than 100 light-years away) to have noticeable effects on its biosphere. gamma rays are responsible for most of the adverse effects a supernova can have on a living Terrestrial planet. In Earth's case, gamma rays induce a chemical reaction in the upper atmosphere, converting Ozone into nitrous oxide, depleting the ozone layer enough to expose the surface to harmful solar and cosmic radiation. The gamma ray burst from a nearby supernova explosion has been proposed as the cause of the end Ordovician extinction, which resulted in the death of nearly 60% of the oceanic life on Earth. Speculation as to the effects of a nearby supernova on Earth often focuses on large stars, such as Betelgeuse, a red supergiant 427 light-years from Earth which is a type II supernova candidate. Several prominent stars within a few light centuries from Sol are candidates for becoming supernovae in as little as a millenium. Though spectacular, these "predictable" supernovae are thought to have little potential to affect Earth. Type Ia supernovae, though, are thought to be potentially the most dangerous if they occur close enough to the Earth. Because Type Ia supernovae arise from dim, common white dwarf stars, it is likely that a supernova that could affect the Earth will occur unpredictably and take place in a star system that is not well studied. One theory suggests that a Type Ia supernova would have to be closer than a thousand parsecs (3300 light years) to affect the Earth. Recent estimates predict that a Type II supernova would have to be closer than eight parsecs (twenty-six light years) to destroy half of the Earth's ozone layer. Such estimates are mostly concerned with atmospheric modeling and considered only the known radiation flux from SN 1987A, a Type II supernova in the Large Magellanic Cloud. Estimates of the rate of supernova occurrence within 10 parsecs of the Earth vary from once every 100 million years to once every one to ten billion years. In 1996, astronomers at the University of Illinois at Urbana-Champaign theorized that traces of past supernovae might be detectable on Earth in the form of metal isotope signatures in rock strata. Subsequently, iron-60 enrichment has been reported in deep-sea rock of the Pacific Ocean by researchers from the Technical University of Munich.